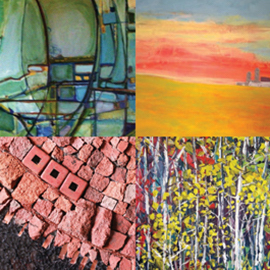 ARTISTS OF THE BRANT STUDIO TOUR: "LOCALLY GROWN"
Original art created in your local community of The City of Brantford and The County of Brant. The Brant Studio Tour is a group of professional artists that strive to promote understanding, appreciation and enjoyment of the wide range of high quality original art created locally by member artists. To celebrate the creative process and its results, they also bring artists and members of the general public together for a unique behind-the-scenes arts experience by opening their working studios one weekend a year (Oct. 1 and 2, 2016).